Healing starts when a soul pulls back the curtains to a deep hurt, inviting another wounded soul to apply the balm of empathy. Bearing in mind that the girls at Residence@St George’s (RSG) had undergone traumatic experiences, we were unsure if they would be willing to start on the journey of healing with us – to share their stories. So… on our fifth week, we thought it would be best to open the sharing with darkness. We placed a candle in front of each person. And as each person shared, the candle would be lit. Its glow represented a sacred space where we could speak without interruptions. One by one, each individual unmasked. Our team member, Karen, started the ball rolling by lighting her candle. The warmth of its fire melted our fears and as each person spoke, we felt transported into various worlds. It wasn’t easy for the girls to open up, and we applaud them for that. One of the girls, L, shared about how she turned “bad” after her mother and some family members passed away when she was in primary school. She was grateful that her father would visit her when she was on remand, in spite of his tiring work schedule. Another girl, N, opened up about her difficulties in letting go of an abusive relationship, because she treasured the friendship. A number of the girls also shared about how their entire families had been separated and placed in various prisons and homes. They hoped to reunite one day. It was heart-wrenching for us to listen to the girls. Why did they have to go through such pain? Would their futures be better? Given time, would they see how their stories could help to heal others? Although heart-wrenching, it was also binding. In that instance, the barriers between us and them broke. Empathy bridged our various backgrounds and we could now understand each other. There was comfort in suffering. We don’t know exactly what their futures hold, but we are quite certain we saw rays of hope in their stories. And we’re positive that they saw the rays too. At the end of everyone’s sharing, all of our candles had been lit and there was a combination of rays permeating the room. Somehow, the darkness seemed a little smaller and less bleak. 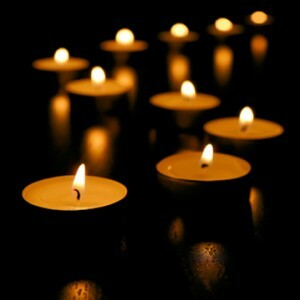 Our stories, represented by the light from each candle, permeates the darkness. Hope shines brighter in darkness… and our stories open the way for empathy.